Readers, it’s been quiet on the blogging front again this week. Got lots on the go at the moment, so it’s taken a tiny backseat, while I catch up on life. I’ve not done as much sweet baking of recent as I’ve been trying to live healthy, hence why quite a few of my recent posts have been savoury focussed. For ages, I’ve wanted to make my own pizza from scratch but wasn’t sure how to. 00 flour has been a revelation. 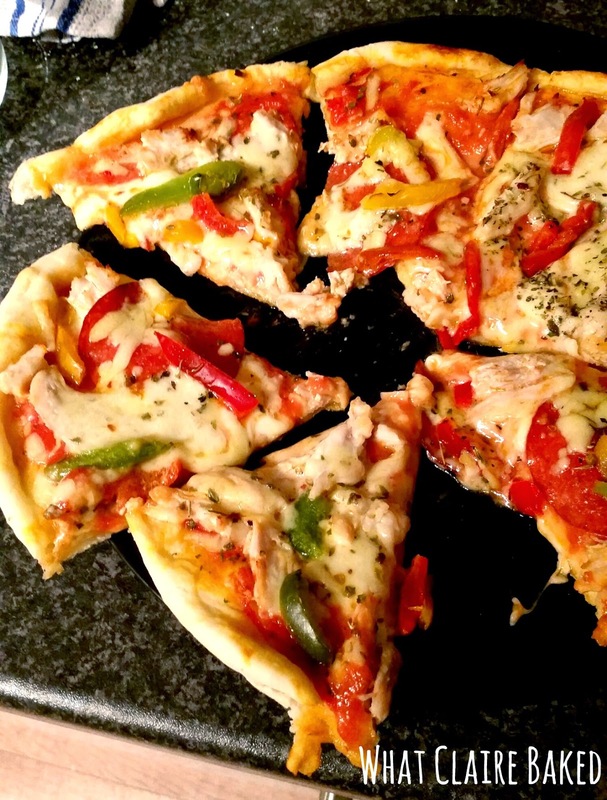 It’s perfect for making pizza and pasta, as the gluten content helps to maintain a good stretch to the dough. Incredibly important when you are headed for a thin and crispy base! This is a relatively simple and easy weekend dish, if you are willing to invest some time in creating the dough. It can be topped with whatever you like, but I made a special pizza sauce. I had some leftover, whichI served with chicken and chorizo pasta the night after. It was delicious! This recipe makes 2 x 9in pizzas. Cornflour mixed to a paste, to thicken. Grated mozzarella cheese is a must! 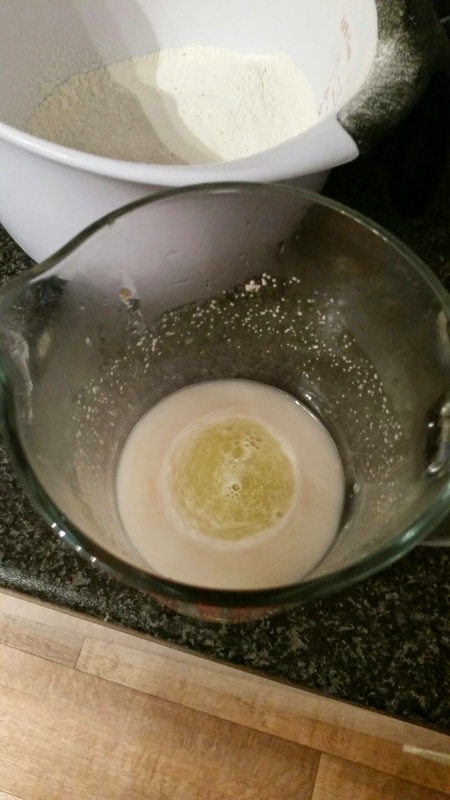 Add the sugar, yeast and olive oil to the lukewarm water and mix together. Add the flour to a bowl and create a well in the middle. Slowly draw in the flour to the middle, until combined. Mix until a dough is formed. Turn out onto a floured board and knead for 5-10 minutes until a smooth and stretchy consistency is reached. Return to bowl, cover with a damp towel and prove in a warm place for around an hour or until doubled in size. Prepare the sauce by adding all sauce ingredients (not the cornflour) to a pan and warm through. Once starting to boil, mix the cornflour and water together and add to the sauce. The sauce should begin to thicken. Remove from the heat and set aside. After 1 hour, return to a floured board and knock back the dough, to remove some of the air. Split in half and roll out 2 x 9in circles. 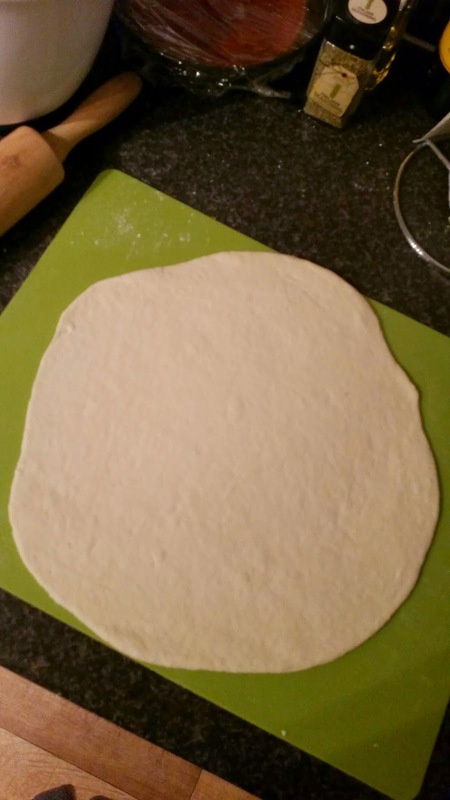 Once bases are rolled out, make a crust by gathering the edges up slightly. Put a thin covering of sauce onto each and spread out across the base. Be careful not to use too much – you don’t want a soggy base. Refrigerate the extra sauce for use the next day! 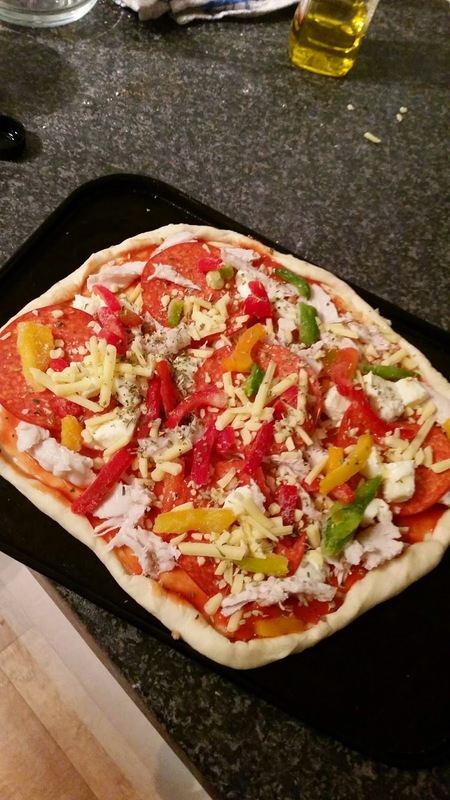 Add your cheese and toppings in layers, until it resembles a very lovely handmade pizza. Transfer to the oven, on a pizza tray if you have one, cook for around 10-12 minutes until the dough is cooked and golden in colour. I'm entering these into #recipeoftheweek over at A Mummy Too. Looks delicious! I've never been good at dough by hand, which is why I'm glad I got the breadmaker for christmas!